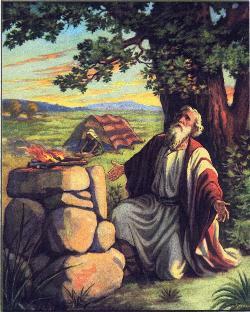 At the time when God spoke to Abraham about His promises, Abraham was very old and he has no children. God told Abraham, “Eliezer will not be your heir but a son of your own will be the heir of your possessions,” Abraham believed in what God said and God accredited it as righteousness. Abraham obeyed God and brought them all before God. Abraham cut all the offerings in half except the bird. Then Abraham put the halves of the offerings that he had cut opposite each other. When the vultures came down to peck on the flesh, Abraham drove them away. As the sun was setting, Abraham began to fell asleep. It was getting dark and there was a smoking oven and flaming torch that go between the pieces of offerings.